Press TV – The European Union is targeting Iran’s hot-rolled steel, planning to hit imports from the country with punitive trade tariffs. According to a document cited in the European media, the European Commission is proposing duties of up to 23 percent for steel from Iran’s Mobarakeh Steel Co.
European steel lobby group Eurofer is at the center of the campaign and has forced Europe’s trade policy oversight European Commission to intervene and check imports. There was no immediate reaction to the plan from the countries being targeted. In June, China reacted furiously after the European Union set duties of up to 35.9 percent on Chinese hot-rolled steel. Mobarakeh Steel Co is Iran’s largest steel producer with 7.2 million tonnes per year. Europe’s tough stance, including its more than 40 restrictive measures aimed at aiding European steel producers, has sparked accusations of protectionism from international steel exporters. The bloc’s steel producers have been pressuring the continent’s leaders to copy America’s draconian regulations, including levies of more than 500 percent on steel imports in some cases. Steelmakers across Europe are faced with mass redundancies because of their high energy costs. Their leaders say the 320,000 jobs in the European steel industry are at risk from imports. Steel is the second biggest industry in the world after oil and gas. The commodity was Iran’s largest export item after oil, gas and petrochemicals last year, partly because of the slump in domestic construction. 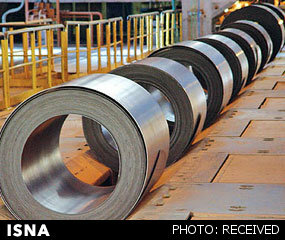 The country has been boosting steel production, targeting an output plateau of 55 million tonnes per year by 2015. Iran enjoys an advantage because production costs at the majority of its steelworks are internationally competitive because of low energy prices in the country. It exported 4 million tonnes of steel last year, according to director of the Iranian Mines and Mining Industries Development and Renovation Organization (IMIDRO) Mehdi Karbasian. Currently, the nation produces 16 million tonnes, which is one percent of the world total. A statement on IMIDRO’s website says exports are expected to hit 20-25 million tonnes by 2025. Steel is a strategic commodity for the country of 80 million, which has the Middle East’s biggest carmaker. It is also key to the country’s massive oil and gas industry, transportation network, water supply, urban centers and mammoth construction sector.